We invite you to explore India - the Land with infinite beauty ! Whether you soar high into Himalayas or peer under the ruins of the Ancient monuments dotting the landscape of India, you will cherish the experience long after your visit ! This India Travel Guide on Temples in Dwarka is free from any commercial interest! This site is dedicated to promote India - the vast subcontinent, its glorious past, magnificent landscape and its infinite variety. Dwarka city, an abode of lord Krishna is located on the shores of the Arabian Sea, in the state of Gujarat (Jamnagar district), India. According to scriptures, Dwarka is considered to be one of the holiest cities in India. Dwarka derived its name from the Sanskrit word 'dvar' meaning door or gate.Ka means gateway and since this place was a thriving port, it was considered a gateway to the hinterland. Philosophically it also meant a gateway to Moksha. History says that lord Krishna withdrew from the battle in Mathura for the welfare of the people living there and shifted his capital to Dwaraka. As per Lord Krishna's instructions, Vishwakarma, a celestial architect, built the city on the banks of the Gomati River. It was built in the Chalukyan style. According to scriptures, the sea damaged and destructed Dwaraka by submerging it six times and today's Dwarka is therefore the seventh such city to be built in the area. 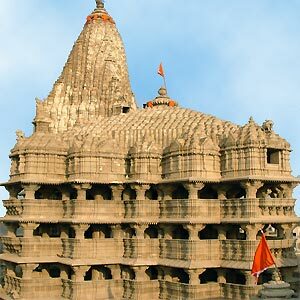 Dwarkadhish temple, also known as Jagat Mandir has been the main attraction to all the devotees and tourists alike. The main Deity in this temple is Lord Dwarkadhish, one of the forms of Lord Sri Krishna. This temple dates back 2500 years. The richly-carved spire rises to nearly 157 feet. This temple was built with sand and limestone and has five floors supported by 60 columns. The carvings on the exteriors of the temple are a sight to behold. The roof of the audience hall in the Jagat Mandir is supported by 60 exquisitely carved columns. You can find the sculptures that indicate the reign of various dynasties such as the Guptas, Pallavas, Chanakyas and Chavdas. Inside the temple, you can also find a black idol of Ranchod Rai - the ruler of Dwarka. The four hands of Lord Dwarkadish carry a conch, wheel, metallic weapon and a lotus. Rukmini Devi temple, built in12th century is devoted to goddess Rukmini. This temple is an architectural master piece with beautiful paintings of lord Krishna and Rukmini. This temple can be found when you go out of the back entrance of the Dwarkadish Temple. The SamudraNarayan Temple is found at the confluence of the Gomati River and the sea. This temple is situated10 km away from Dwarka wherein Lord Shiva has taken the form of Jyotirlingam in an underground chamber. Besides these important temples, Dwaraka is also famous for beautiful Swaminarayana temple, Sharada Pitha (one of the four cardinal maths established by Sri Adi Shankaracharya)and Somnath Temple of lord Shiva. Do not miss visiting Bet Dwarka, a small island near Dwarka. At Bet, there are temples of Vishnu (in the form of 'matsya'), Radha, Lakshmi, Satyabhama, Jambuvanti. You can find plenty of budget lodges and dharamshalas. You can also pick from few luxury hotels. Dwarka is well connected by road to the rest of Gujarat. If you are traveling by train, you can board one from Jamnagar, Rajkot or Ahmedabad. Jamnagar is the nearest airport. The festival of Janmasthami is celebrated in a big way in Dwarka. During the month of Shravan, the Swing Festival or Jhoola Festival is celebrated wherein the idol in the Dwarkadish Temple is adorned with jewels, flowers and finery.